Timeshare at Amarilla Golf is a mixture of detached bungalow villas, an occasional two storied villa, and a selection of apartments, most of this is typical Tenerife accommodation in the local style with white walls and red tiled roofing, virtually all the luxury apartments have views of the golf course, the sea or both. 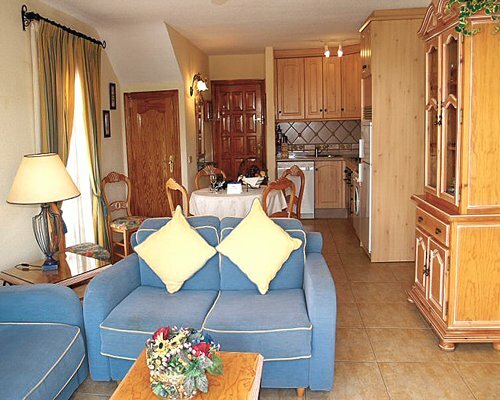 The timeshare villas at the Amarila Golf & Country Club have a beautiful terrace and feature two or three bedrooms. They are well turned out with rich furnishings and fully-fitted kitchens with large refrigerator, cooker and even a washing machine. The accommodations also have a pleasant lounge area with a balcony, and some even coming with a private garden, a garage and a private pool area. You can also find a sprinkling of shops, bars and restaurants. 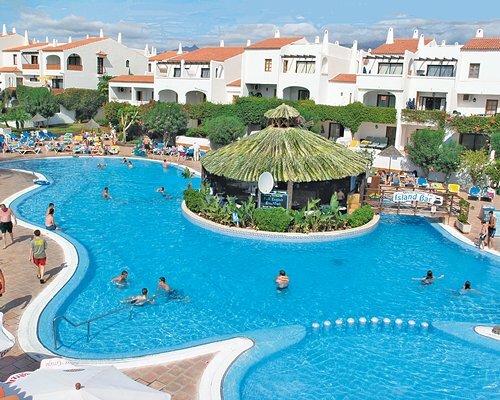 Some of the finest golden sandy Tenerife beaches are close to the Amarilla Golf and country club including the Championship windsurfing beach at El Medano as well as the vast stretch of Playa de la Tejita beach for those of you that are real sun worshippers. Both of these Tenerife beaches are a mere ten minutes drive from Amarilla Golf.